(a) Remove the No. 1 console box carpet. 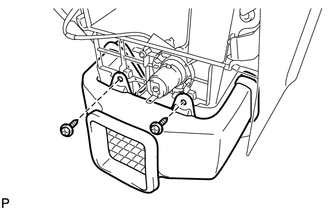 (a) Pull the instrument panel cup holder damper in the direction indicated by the arrow to remove the instrument panel cup holder damper. 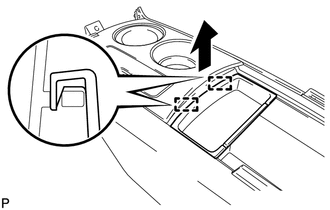 (a) Pull the console box pocket in the direction indicated by the arrow to disengage the 2 guides and remove the console box pocket. 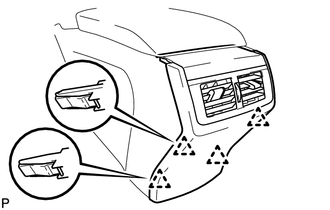 (c) Disengage the 2 claws and remove the front console box cover. 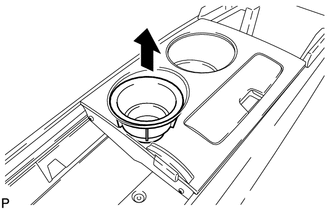 (a) Slide the rear console upper panel sub-assembly in the direction indicated by the arrow and remove the rear console upper panel sub-assembly. 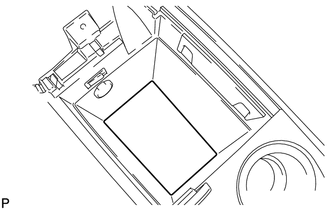 (a) Remove the 2 screws and the No. 2 console box duct. 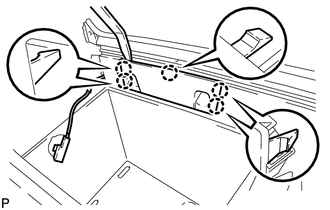 (a) Using a moulding remover, disengage the 5 claws and remove the console mounting retainer assembly. 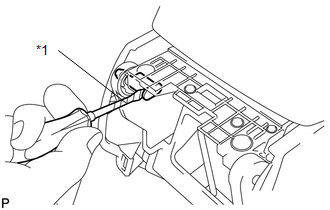 (a) Disconnect the connectors to remove the console box wire. 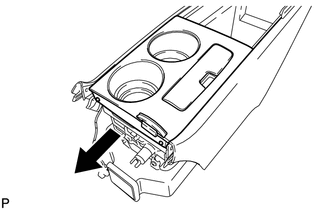 (a) Disengage the 4 clips and remove the rear console end panel sub-assembly. 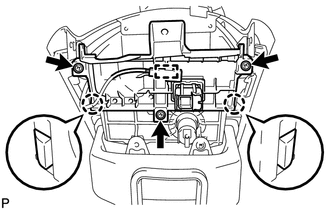 (a) Using a screwdriver, remove the 2 E-rings. Be careful not to allow the E-rings to pop out when removing them. 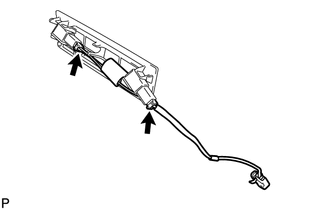 (b) Using a screwdriver, pull out the box door hinge shafts. 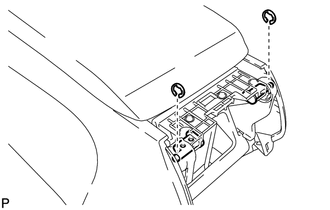 (c) Remove the rear console armrest assembly.